With a year having passed since the start of the greatest economic crisis in our lifetimes, you’d think we would know a lot more now than we did then about what caused it. Yet by the spring of 2008, a three-part conventional wisdom about the crisis had taken hold that still governs mainstream thinking about what happened and why—even though there was never any evidence in favor of the conventional wisdom, and there is now much evidence against it. The first part of the conventional wisdom began to make its way into public consciousness soon after September 15, 2008, when most people thought of the crisis as a burst housing bubble. Bubble talk naturally leads to visions of “irrational exuberance,” and the notion that home buyers, bankers, and investors had irrationally thought that house prices would keep rising forever quickly took hold. But in reality, very sober housing experts and economists (including Ben Bernanke) agreed that there was no bubble, and there was nothing “irrational” about this consensus. After all, housing prices had risen steadily since the Depression as the U.S. population grew and its affluence increased. Why shouldn’t people keep buying bigger, more expensive homes? There had never been a significant nationwide housing bubble, and housing speculation in “hot” markets such as Miami and Las Vegas could be quite rationally dismissed as localized. Those who dismissed the bubble may have been wrong--but they had good reasons for their error; there was nothing irrational about it. Likewise for those who participated in the bubble. For instance, Peter Wallison points out that in most states, “no-recourse” laws effectively removed penalties from home buyers and house flippers who walked away from their mortgages if their investments went sour. So there was a legally sanctioned incentive to gamble on rising prices, and it was hardly irrational for people to take advantage of this incentive by buying into the bubble. Although careful scholars have grouped psychologically established behavioral biases under the term "irrationality," in the present context the term can easily become an emotionally satisfying but non-explanatory explanation for people’s mistakes. In retrospect, housing investments premised on ever-rising prices can be labeled “irrational,” but the label explains nothing about why people actually made their mistakes. Eventually scholars and pundits began to realize that even a burst housing bubble was not enough to have caused the crisis, since what we were experiencing was a banking crisis (albeit one that was triggered by a burst housing bubble). Many banks had invested heavily in triple-A rated tranches of subprime mortgage-backed securities, and when delinquencies and defaults on subprime mortgages began to spike, the price of these tranches began to fall, calling into question the solvency of banks that had invested in them. But since nobody knew which banks had the biggest subprime investments, or how far the value of these investments would eventually fall, the effect of the sudden re-evaluation of their soundness was to trigger interbank panic, a lending freeze, and the recession; or so most scholars now believe. How can the banks’ investments in subprime mortgage-backed securities be explained? Here, too, "irrationality" could be invoked, since it can be used as an all-purpose tool to "explain" any error. But self-interest, i.e., "greed," is always the most popular explanation among economists—and the general public. So a new idea took root: Far from being irrational, bankers knew how risky these investments were, but made them anyway because they were paid big bonuses for short-term profits. This “executive compensation” theory of the crisis is now the keystone of the conventional wisdom, having been embraced by President Obama, the leaders of France and Germany, and virtually the entire financial press. But if anyone has evidence for the executive-compensation thesis, they have yet to produce it. It’s a great theory. It “makes sense”—we all know how greedy bankers are! But is it true? The evidence that has been produced suggests that it is false. For one thing, bankers were often compensated in stock as well as with bonuses, and the value of this stock was wiped out because of the investments in question. Richard Fuld of Lehman Brothers lost $1 billion this way; Sanford Weill of Citigroup lost half that amount. A study by Rüdiger Fahlenbrach and René Stulz  showed that banks with CEOs who held a lot of stock in the bank did worse than banks with CEOs who held less stock, suggesting that the bankers were simply ignorant of the risks their institutions were taking. Journalists’ and insiders’ books about individual banks bear out this hypothesis: At Bear Stearns and Lehman Brothers, for example, the decision makers did not recognize the risks until it was too late, despite their personal investments in the banks’ stock. Perhaps the most powerful evidence against the executive-compensation thesis, however, is that 81 percent of the mortgage-backed tranches purchased by banks were rated AAA, and thus produced lower returns than the double-A and lower-rated tranches of the same mortgage-backed securities that were available. Bankers who were indifferent to risk because they were seeking higher return, hence higher bonuses, should have bought the lower-rated tranches universally, but they did so only 19 percent of the time. And most of those purchases were of double-A rather than A, BBB, or lower-rated, more-lucrative tranches. Both the myth of irrational exuberance and the myth of bankers’ bonuses have contributed to the notion that the excesses of capitalists—whether irrational excesses or self-interested ones—were the root cause of the crisis. Without the first two myths, however, the “Capitalism Did It” thesis itself begins to look more like a myth than a reality. Obviously capitalists were involved in the crisis—bankers were not government officials. But with irrationality and bonuses out of the way, the question is why bankers bought those triple-A mortgage-backed securities, and the answer may well lie in the regulations promulgated by government officials. Had bankers been looking for the safety connoted by triple-A ratings, they could have bought Treasurys, which were even safer. If they were looking for yield, they could have bought double-A or lower-rated bonds. And why mortgage-backed bonds? The answer seems to be an obscure rule enacted by the Fed, the FDIC, the Office of the Comptroller of the Currency, and the Office of Thrift Supervision in 2001: the Recourse Rule, an amendment to the Basel I accord that governed banks' capital minima. Under the Recourse Rule, an AA- or AAA-rated asset-backed security, such as a mortgage-backed bond, received a 20-percent risk weight, compared to a zero risk weight for cash and a 50-percent risk weight for an individual (unsecuritized) mortgage. This meant that commercial banks could issue mortgages—regardless of how sound the borrowers were—sell them to investment banks to be securitized, and buy them back as part of a mortgage-backed security, in the process freeing up 60 percent of the capital they would have had to hold against individual mortgages. Capital held by a bank is capital not lent out at interest; by reducing their capital holdings, banks could increase their profitability. To be sure, banks that bought mortgage-backed securities to reduce their capital cushions were, indeed, knowingly increasing their vulnerability if the investments turned out badly. But absent the Recourse Rule, there is no reason that banks seeking a safe way to increase their profitability would have converged on asset-backed securities (rather than Treasurys or triple-A corporate bonds); thus, they would not have been so vulnerable to a burst housing bubble. The Recourse Rule artificially boosted the profitability of a certain type of investment that the Fed, the FDIC, and the other regulators thought was safe. We know in retrospect that the capitalists who took advantage of the Recourse Rule, such as those at Citibank, were making a mistake. But not all capitalists made this mistake, even though it was costly for them to turn down the higher profits offered by the Recourse Rule. JPMorgan, for instance, recognized the danger and escaped destruction. None of these capitalists were irrational; all were self-interested; yet they had different perceptions of how to pursue their self-interest, based on different perceptions of risk. In relatively unregulated markets, this diversity of viewpoints is precisely what makes capitalism work. One capitalist thinks that profit can be made, and loss avoided, by pursuing strategy A; another, by pursuing strategy B. These heterogeneous strategies compete with each other, and the better ideas produce profits rather than losses. In a complex world where nobody really knows what will work until it is tried, competition is the only way that people’s endless capacity for error can be checked, and loss is the regrettable but inescapable result. In the banking industry, however, bankers’ heterogeneous strategies were homogenized (although not entirely) by the Recourse Rule, which loaded the dice in favor of the regulators’ ideas of where risk did and did not lie. The regulators thought that AA or AAA tranches of asset-backed securities were 60-percent safer than individual mortgages. To be sure, this was not an “irrational” theory, either: The tranching structure created by Moody’s, Standard and Poor, and Fitch had a lot to be said for it, and even the little-known fact that the SEC had effectively conferred oligopoly status on these three rating companies did not guarantee that disaster would follow from placing further official weight on their ratings. 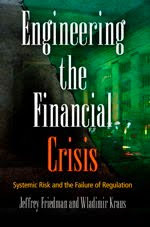 But the crucial fact is that however reasonable it seemed at the time, the Recourse Rule imposed a new profitability gradient over the bankers’ calculations, producing the same effect that is intended by all regulations: The regulatory carrot altered the behavior of those being regulated, the better to align it with the regulators’ ideas about what would make for prudent banking. By thus homogenizing the heterogeneous competitive process, the regulators inadvertently made the banking system more vulnerable--if, in fact, the regulators’ theory turned out to be wrong. If we seek the sources of a systemic failure, a logical place to look is among the legal rules that govern the system as a whole. Unfortunately, being legal mandates, these rules--unlike the different strategies pursued by competing capitalists--aren't subjected to a competitive process. So if they are based on mistaken ideas, we all suffer the consequences. That turned out to be the case with the Recourse Rule. Contrary to popular belief, then, the crisis of 2008 is best described as a crisis of regulation—not a crisis of capitalism. Although judging from his recent New York Times Magazine article, Paul Krugman has not yet realized this. See my earlier post on this blog, "Is Macroeconomics Relevant?" "Bank CEO Incentives and the Credit Crisis." Social Science Research Network. The best of these is William D. Cohan’s House of Cards, which shows that the chief executives and subordinate players at Bear Stearns had full faith in the triple-A ratings of the subprime securities in which they had invested. Lawrence G. McDonald and Patrick Robinson’s A Colossal Failure of Common Sense, about Lehman Brothers, inadvertently makes the same point, despite the authors’ conviction that “common sense” should have revealed to the decision makers that they were mistaken. Gillian Tett’s Fools’ Gold, conversely, shows that at JPMorganChase, Jamie Dimon and his subordinates saw great risk in mortgage-backed securities and largely avoided them. Evidence from the Cohan and Tett books is assembled in my “A Crisis of Politics, Not Economics: Complexity, Ignorance, and Policy Failure,” Critical Review 21(2-3): 127-84, available online. We won't know with any certainty, however, that bankers did buy these securities because of the Recourse Rule until somebody actually asks them, in confidence. This research is being undertaken by Wladimir Kraus of the University of Turin. I take it you then dismiss Shiller's chapters in the second edition of Irrational Exuberance showing that housing prices beginning in 2005 were overpriced because Ben Bernanke said they weren't? As for the existence of "some" states having recourse loan provisions in their statutes as an explanation for "not irrationally overpriced houses", which states had non-recourse loan provisions, and which states added those provisions to their statutes from 2003 to 2009? In other words, did the statutes change during this period. If the non-recourse loan provisions did not change during this period, how can you argue that they were the cause of the high priced houses during this period? The statutes were in effect in prior periods. Can you show that states introduced added non-recourse loan provisions during this period and that caused those states to have higher priced houses than would otherwise be predicted? What data do you have to support any of these claims? Your first argument contradicts Shiller's work using its now-famous index; I do not think anyone should buy your argument before you refute Shiller's. By the way, I do not think this is a good time to argue that there was no house bubble because experts didn´t think there was one. The attempt to find some bad law in "some states" to argue that this is a government failure sounds very desperate, and seems to suggest that the market will only work if bureaucrats make the right call every single time. Your second point, concerning bonuses, may be right. But the arguments you employ to support it do not sound right. The first - CEOs were compensated with stock also - doesn´t sound right because, when the bubble was inflating, I assume (maybe wrongly) that risk-taking paid of both in terms of bonuses and in terms of stocks. And when the bubble was deflating, I doubt CEOs were expecting much from their stock, so it might be rational (depending on other conditions) to compensate the future loss in stock value by maximizing bonuses. Regarding the 81% figure, no one is saying that bonus-seeking executives were capable of choosing any portfolio they wanted. Nobody would trust a bank that had a portfolio composed exclusively of raging-mad investments. We are talking about incentives somewhat in one direction or the other (say, to 81% instead of 90%). Finally, if I understand the Recourse Rule, it did not force banks to do anything. Returns in mortgage-related stuff were very high, and, as you rightly noted, experts claimed there was no bubble. If banks did not think mortgage-backed securities were a good idea, they would not have been tricked into buying them because the government allowed them to. If Obama now removes any taxes or restrictions on investing in Mugabe’s Zimbabwe, I do not think there will be a Zimbabwe bubble. Unless, of course, the market has a short-term bias that caused myopia, but I don´t think this is an argument you would make. Once again, if the market depends on bureaucrats getting economic minutiae right, it is too fragile a system for regulating our lives. Nevertheless, I suspect that it does not; it rather produces bad outcomes every now and then (less frequently, for instance, than a government-run economy). We should correct these problems, not deny their existence with statements of principle. It may not have been irrational the same way bribery or robbery may not be irrational. Take the money and run. Don't worry about tomorrow. Key industry people walked away with billions in bonuses and not all in stock and junk. That it was at the expense of their jobs, their institutions, and even their bosses, must have made it all the sweeter. Finance separates fools from their money even if the fools run financial institutions. The agent problem is real. One has to ask how regulators arrived at their rule. Somewhere out of the blue? This is indeed a competitive process between institutions seeking the favor of government and bending it to their will. If by myth you mean allegories of truth, yes, then these are myths. Posters--I misquoted Wallison, and thank you for pointing it out; it has now been corrected: "Most" states had no-recourse laws, not just "some" states. As to those laws having caused the bubble, however, I said no such thing. The same applies to all of the other comments thus far. As an editor, I realize that blogging and commenting do not lend themselves to careful reading, but as I hesitate to repeat what I already said in the main post, careful reading of it is all I can recommend. Ok, now you rewrite it as Most states have no recourse laws. So. They had no recourse laws before when there was no bubble. What changed? Don't banks participating in the market know there are no recourse laws when they make their loans. Did they just forget? Friedman never mentions that recourse laws created a housing bubble. Friedman's first paragraph deals with his finding that there was no housing bubble. After that he leaves the concept of a housing bubble alone. If you move on to the second section of his post you will not see anywhere a mention of a housing bubble. He describes the recourse law as a regulation that gives incentives to bankers to buy mortgage backed securities. That is all that he says. Nowhere in Friedman's post is there any mention to the idea that the recourse law caused the housing bubble. The original poster needs to thoroughly reread the post and then reevaluate his or her claims. If Greenspan had said financial innovation had made it possible to fly off the top of the Empire State Building, and the Basel conventions stated falling from heights less that 10,000 feet was prudent, it wouldn't have been the fault of bankers getting fees and bonuses from selling jumping rights to other bankers for experience of safely flying to the ground for the pile of dead bankers and pedestrians? If bankers got no fees or bonuses for buying and packaging subprime mortgages they wouldn't have been buying and setting up mortgage originators to push subprime mortgages to feed the demand for paper. Or as another person noted on a radio call-in, quoting someone else, if real innovators were creating new companies producing cutting edge technology for say energy or highly efficient "eco" modular factory built construction materials, say as a result of a green initative to make the US independent of imported oil and thus immune to Persian Gulf conflict, the bankers would have been financing productive capital investment instead of financing at best consumption to be paid for over the next 30 years. Make no mistake: it was a bubble. A large area of irrationality that I believe your piece misses has to do with risk, which (to me at least) is quite obviously where investors and regulators both failed. If risk had been rationally factored into the rising house prices, the crisis would not have occurred. Of course, the risk wasn't priced in. Loans were still available at low rates, which would have been rational if the potential default rates were much lower. They weren't. At every level, in organizations both public and private the risk of individual loans, and more importantly the combining of those loans, was completely ignored. If you want to have a regulation based critique, you fault the regulators. If you argue for a freer market approach, you blame the investors. But in any case, the entire market was irrational about the risk the market contained. "But absent the Recourse Rule, there is no reason that banks seeking a safe way to increase their profitability would have converged on asset-backed securities (rather than Treasurys or triple-A corporate bonds); thus, they would not have been so vulnerable to a burst housing bubble"
This is crucial to Friedman's argument, by the way. If government simply chanelled resources into non-bubbly investments, and/or, as it is now claimed, it did not cause a bubble by doing so, is hard to see how the crisis came about. And, no matter how many times I re-read it, I still have not found a refutation of Shiller, without which I think the whole discussion is pointless. Let´s "establish the phenomenae" first. By the way, concerning endnote 6: "We won't know with any certainty, however, that bankers did buy these securities because of the Recourse Rule until somebody actually asks them, in confidence"
What is the plan? To ask bankers, "So, is the crisis the market's fault, which implies you should be more regulated, or was it the government's, in which case you should be left alone?"? I am sure it isn't, but that's the impression one gets from the writing. I am the author of Anonymous comments 1 2 3 and 5, and I agree with NPTO last comment and challenge. I just have trouble rationally understanding the author's argument, although I can understand the conclusion he is trying to reach: that regulation (and not the failure of or quality of regulation) caused the problem. I am also trying to be hard on the author, challenging him to offer evidence supporting his conclusions and reasoning on how he got there. NPTO, Why do you and Anonymous sound so desperate to pick holes in Friedman's article? Has he hit a nerve? Friedman says that Wladimir Kraus is interviewing bankers, not that Friedman is doing it. Interviews have their problems, but how would you investigate why bankers did what they did? At least Friedman is telling us about a possible cause of the crisis that we haven't heard of before. What is your contribution? And what is Shiller's important point that you keep referring to? Friedman's saying the bubble wasn't "irrational." He's not saying it didn't exist. He's saying the opposite. It existed. People like Bernanke who denied that it existed were mistaken. (Greenspan too.) But he's saying that mistaken does not = irrational. Please tell us, what exactly does Shiller say to rebut this?? Aaron calls everyone who made incorrect risk judgments "irrational." That doesn't explain anything. Also, Aaron claims that "the entire market" was irrational. That's not true. Friedman's main point is that the regulators imposed their mistaken ("irrational"?) theory on bankers, but that some bankers like Dimon resisted even though the regulators made it artificially profitable to buy subprime securities. Without that artificial encouragement even fewer bankers would have made this mistake. Didn't you understand the part at the end of Friedman's article about "heterogeneous" capitalists vs. "homogenizing" regulations? Private gains and public losses are rational for individuals but are they for society? Short term bonuses and securitization create inherent time focus and agency problems. These are real. Government and regulators don't act without cause but at the demand of business and markets. The government didn't decide on its own to prefer ABS, nor did it decide on its own to allow increased leverage. Treating it as a black block obscures rather than illuminates. Another anon: Perhaps I don't fully understand it, as I'm not fully convinced. Within that description, we read about the credit agencies had "oligarchy status". Was everyone who was making investments based on their ratings really doing analysis based on whether or not those agencies were wrong? I'm not talking about the Recourse Rule's risk weights, but the internal financial modeling each large firm was purportedly working on. At a certain point, risk modeling becomes impossibly recursive. And, like you've mentioned, some bankers kept their heads. I overgeneralized about the entire market, but every major player was affected. But the take home lesson in all of this, to me at least, is that due to the huge quantity of information available, risk is a long ways away from being adequately quantified. In a deregulated system, there's the advantage that mistakes received quicker feedback. To the person who said: "NPTO, Why do you and Anonymous sound so desperate to pick holes in Friedman's article? Has he hit a nerve?" This is not a psychoanalsis session of why someone is asking a question. It does hit my nerve when someone makes an assertion and doesn't support it. As to what is Irrational Exuberance, it is a very good book. Read the second edition. If you want to learn more, you can watch the entire Yale finance course Shiller teaches at oyc.yale.edu He discusses it in more detail, but the finance course and the math are pretty good too. Enjoy. While we're at it: it is no defense in the argument that the bankers didn't do it for greed because they were ignorant of the risk. It is just as bad to be ignorant, and be paid for it, than to be greedy, know the risk you are taking, and bet the house. Either one is bad, but, since you concede that they were ignorant and well paid, that probably is enough. Being overpaid for ignorance is pretty bad too. But, I don't think they were ignorant. Surely, not executives, but salesmen greed, the boys who did the selling and were on commission. Them, and the corporate environment that accommodated them, there's your guilty parties. There, was that so difficult? Not an economist, but I did watch the real estate market in my neighborhood in Chicago over the last decade. To look at the appreciation of prices and conclude there was no reason to assume it was a bubble is not a concept that makes sense. Prices grew to insane levels in a very short period of time. If that does not signal a bubble, then what does? Mortgage brokers made a pretty penny on terrible loans made to people who had no hope of paying them back. To look at NINJA loans or the no-doc loans as "rational" ways of conducting business - again, I do not understand how you can say this. That Richard Fuld had a billion dollars in stock options to lose does in fact provide rather suggestive evidence of an out-of-whack compensation system. I'd like to know how much cash he walked away with, in addition to the options. Were his flower purchases and dry cleaning expenses covered in his parachute, a la Jack Welch? What about the compensation of the rank and file within the banks? Were they given stock options or cash bonuses? The behaviors of the employees were critical to the build up of toxic assets, not just the actions of the occupants of the C-Suite. And a financial system alive today thanks solely to the generosity of the government is a sorry excuse of capitalism. To say that the behaviors of brokers and bankers were blameless but we need more regulation to avoid such a meltdown again is an odd argument. We need better regulation because the behaviors of bankers and brokers were terribly risky in ways they didn't need to be. JPMorgan's behavior, as you note, indicates that not all businessmen choose to engage in terrible business activities - even without prudent regulation to rein them in. Nothing will change if economists point the finger only at the flaws of government. And with TBTF institutions now even bigger, I'm not sure there'll be a bailout big enough next time. Anne, you are confused. A local real estate bubble is not a national one. Bernanke, Greenspance, and all the rest of the economists knew there were local bubbles but denied there was a national one. You are saying they are wrong but were they irrational? You have a confused definition of irrational as wrong and rational as right. Friedman isn't saying bankers were blameless, he is just saying that to understand what they did, calling them crazy does not help. He is trying to understand not blame. And where does he say that we need more regulation? I read the second part of his article as saying regulators caused the problem! "The underlying weakness in our financial system today is the illiquid mortgage assets that have lost value as the housing correction has proceeded." As an ordinary citizen, living a life far removed from math models and Wall Street, this indicates to me the repercussions of the explosion of a national bubble. I cannot for the life of me understand how the collapse of bubbles in isolated markets could cause such a catastrophic impact on our economy. So it would seem Bernanke, et al, were wrong about the localized nature of the bubble. To then say that the "no-recourse laws" gave consumers the idea to buy houses they couldn't afford because they could walk away later - well, perhaps there is a large population of Americans who did that, I don't know. The consumers I know who have upside-down loans are not the ones who walked away and they're just stuck right now. However, you cannot have a borrower without a lender. For bankers to make large number of loans to people without the income to support it - there's nothing rational about that - unless they believed in the irrationally exuberant notion that the value of the collateral would skyrocket upward forever. There was a time in America when this story would have ended with the loan application. But this time, it didn't. And the crash is the result of borrowers who felt liberated by the no-recourse rules? I am intrigued by the notion that highly compensated bankers were powerless in all of this. Unfortunately, being legal mandates, these rules--unlike the different strategies pursued by competing capitalists--aren't subjected to a competitive process. Not entirely true, given the operation of competitive jurisdictions. Surely, a sensible thing to do is cross-country analysis of which financial systems did not "freeze up". Australian (and I believe Canadian) prudential regulation seems to have worked rather better. So the wrong mix of regulation seems to be the issue. Be careful about "capital." Banks do "lend" capital out at interest--I guess. It is a source of funds, not a type of asset. It is the funds the owners put in the bank, and it it used to finance, fund, all sorts of assets, and these can earn interest. If a bank has a lower capital requirement, it can borrow more and lend that money out at interest. The lower requirement means that the current amount of fund the owners have contributed to the bank can be a smaller fraction of the total borrowing and total lending of the bank. Hey, I heard Rogoff on NPR and he said about the same thing. And I know he knows better. "Perhaps the most powerful evidence against the executive-compensation thesis, however, is that 81 percent of the mortgage-backed tranches purchased by banks were rated AAA, and thus produced lower returns than the double-A and lower-rated tranches of the same mortgage-backed securities that were available. Bankers who were indifferent to risk because they were seeking higher return, hence higher bonuses, should have bought the lower-rated tranches universally, but they did so only 19 percent of the time. And most of those purchases were of double-A rather than A, BBB, or lower-rated, more-lucrative tranches." If that's your most powerful evidence than perhaps your conclusions are invalid. For the most part, the investment banks didn't really purchase the 'AAA' tranches of the CDO's so much as retain them to facilitate the transactions which would permit the bank to book millions of dollars in investment banking fees available for bonus. Without the banks retention of the 'AAA' these transactions would not have taken place and bankers would not have earned the fees. It was clearly an arrangement where the bankers were paid currently while the bank took long term risk with no downside for the banker if losses were subsequently realized. There may not have been a national housing bubble, but it seems there were enough local or regional bubbles to cause the same result. It is the realtors and builders and mortgage brokers who need to be regulated by the Federal Reserve. Realtors did away with professional appraisors by lobbying for the right to do this themselves. Then they did away with the hard earned skills of professional engineers by getting themselves the right to do home inspections. They got themselves the right to do these things when they lack the decade of experience. What does the recent financial crisis suggest about the relationship between capitalism and democracy? What role did the Japanese Financial Crisis of the early '90s play in the subsequent E.Asian financial crisis?